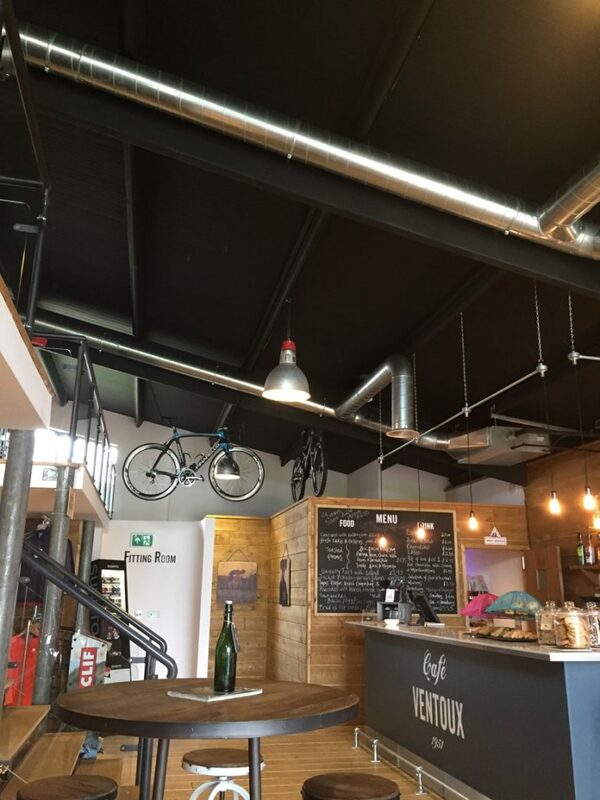 Café Ventoux is a stylish café in Tugby, Leicestershire that serves the cycling community. Serving nutritious food and drink to keep cyclists on the road, the café also hosts an events calendar for keen cyclists and has an online cycling boutique with major road cycling brand names. Café Ventoux was looking for an effective yet economical solution for both heating and cooling. The café, which includes a Retail experience centre a Wattbike training and a yoga studio, found they had multiple needs for both heating and cooling. The building is a barn conversion so suffers from extremes of heat and cold, coupled with the heat from physical exertion and the heat from the café. Glenfield Group advised that the best solution would be to use an LG ducted system in the open plan café area, with specific ceiling mounted heat pump inverter driven cassette units in the hotspots of the yoga studio and cycle training rooms. The café also required a stylish finish, so the ductwork was left exposed to fit in with an ‘industrial’ look.